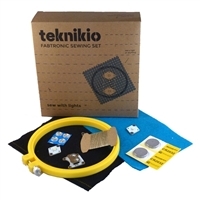 Learn how to sew a simple light circuit with Teknikio's Fabtronic Sewing Kit. Custom re-usable Teknikio sewing parts make it easy to sew on electronics, even if it's your first time sewing! Learn about soft circuits and bling up your fashion! Recommended for ages 10.